How do I get a copy of medical records from a nursing home? One of the most important steps in determining if a cause of action exists against a nursing home or hospital is to review the medical records. The records will help determine what– if any– mistakes were made by the facility in the care of the individual. Getting medical records from a nursing home, physician or hospital can be a daunting task due to privacy regulations (HIPPA) and misunderstanding of the laws that apply to obtaininging the records– both on the part of the person requesting the records and on the part of the medical facility. A resident’s contract with a nursing home facility should designate the name of the resident’s representative, if any, which authorizes the representative to inspect and copy the resident’s records. (210 ILCS 45/2-202) Nursing home residents also have the right to privacy regarding the content of resident records. In some states, such as Illinois, a nursing home resident has the right to sue the facility in court in order to get his or her medical records. 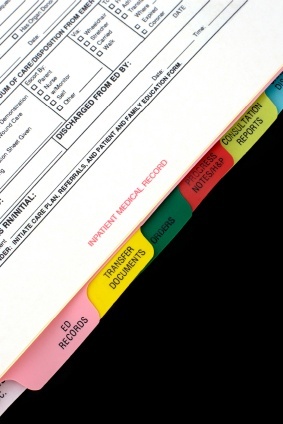 Illinois law provides that every private and public health care facility must allow a patient or patient’s legal representative to examine the health care facility records kept in connection with the treatment of the patient (history, bedside notes, charts, pictures and plates) and make copies of such records. Federal law also provides that the resident or the resident’s legal representative has the right to access all records including clinical records within 24 hours and receive photocopies for a standard charge. (42 CFR §483 – Resident’s rights) The resident also has the right to personal privacy and confidentiality of all personal records. As such, the resident may approve or refuse the release of personal and clinical records to any individual outside the facility unless resident is transferred to another health care institution or release is required by law. Federal Law – 42 CFR §483 – Resident’s rights. 210 ILCS 45/1-104 – “Access” means the right to: (4) Inspect the clinic and other records of a resident with the express written consent of the resident. 210 ILCS 25/2-104 – (d) Every resident, resident’s guardian, or parent if the resident is a minor shall be permitted to inspect and copy all his clinical and other records concerning his care and maintenance kept by the facility or by his physician. The facility may charge a reasonable fee for duplication of a record. 210 ILCS 45/2-201. To protect the resident’s funds, the facility: – (3) Shall maintain and allow, in order of priority, each resident or the resident’s guardian, if any, or the resident’s representative, if any, or the resident’s immediate family member, if any, access to a written record of all financial arrangements and transactions involving the individual resident’s funds. 210 ILCS 45/2-202. – (h) – The contract shall designate the name of the resident’s representative, if any. The resident shall provide the facility with a copy of the written agreement between the resident and the resident’s representative which authorizes the resident’s representative to inspect and copy the resident’s records and authorizes the resident’s representative to execute the contract on behalf of the resident required by this Section. 210 ILCS 45/2-206. – (a) The Department shall respect the confidentiality of a resident’s record and shall not divulge or disclose the contents of a record in a manner which identifies a resident, except upon a resident’s death to a relative or guardian, or under judicial proceedings. This Section shall not be construed to limit the right of a resident to inspect or copy the resident’s records. (b) Confidential medical, social, personal, or financial information identifying a resident shall not be available for public inspection in a manner which identifies a resident. 210 ILCS 45/2-217. Order for transportation of resident by ambulance. If a facility orders transportation of a resident of the facility by ambulance, the facility must maintain a written record that shows (i) the name of the person who placed the order for that transportation and (ii) the medical reason for that transportation. The facility must maintain the record for a period of at least 3 years after the date of the order for transportation by ambulance. 210 ILCS 45/3-801.1. Notwithstanding the other provisions of this Act to the contrary, the agency designated by the Governor under Section 1 of “An Act in relation to the protection and advocacy of the rights of persons with developmental disabilities, and amending Acts therein named”, enacted by the 84th General Assembly, shall have access to the records of a person with developmental disabilities who resides in a facility, subject to the limitations of this Act. The agency shall also have access for the purpose of inspection and copying, to the records of a person with developmental disabilities who resides in any such facility if (1) a complaint is received by such agency from or on behalf of the person with a developmental disability, and (2) such person does not have a guardian or the State or the designee of the State is the guardian of such person. The designated agency shall provide written notice to the person with developmental disabilities and the State guardian of the nature of the complaint based upon which the designated agency has gained access to the records. No record or the contents of any record shall be redisclosed by the designated agency unless the person with developmental disabilities and the State guardian are provided 7 days advance written notice, except in emergency situations, of the designated agency’s intent to redisclose such record, during which time the person with developmental disabilities or the State guardian may seek to judicially enjoin the designated agency’s redisclosure of such record on the grounds that such redisclosure is contrary to the interests of the person with developmental disabilities. If a person with developmental disabilities resides in such a facility and has a guardian other than the State or the designee of the State, the facility director shall disclose the guardian’s name, address, and telephone number to the designated agency at the agency’s request. Upon request, the designated agency shall be entitled to inspect and copy any records or other materials which may further the agency’s investigation of problems affecting numbers of persons with developmental disabilities. When required by law any personally identifiable information of persons with a developmental disability shall be removed from the records. However, the designated agency may not inspect or copy any records or other materials when the removal of personally identifiable information imposes an unreasonable burden on the facility. For the purposes of this Section, “developmental disability” means a severe, chronic disability of a person which ‑ (A) is attributable to a mental or physical impairment or combination of mental and physical impairments; (B) is manifested before the person attains age 22; (C) is likely to continue indefinitely; (D) results in substantial functional limitations in 3 or more of the following areas of major life activity: (i) self-care, (ii) receptive and expressive language, (iii) learning, (iv) mobility, (v) self-direction, (vi) capacity for independent living, and (vii) economic self-sufficiency; and (E) reflects the person’s need for combination and sequence of special, interdisciplinary or generic care, treatment or other services which are of lifelong or extended duration and are individually planned and coordinated. My beautiful 47 year of Lisa First gets the ambulance rushing her to the ICU hospital makes them leave ICU even though it was serious enough to need to be on oxygen machines for two days. Just on the 3rd day moved to the recovery floor. Now to be dumped tho the nurse’s sing home. I have a big issues what I wittiness to my Lisa on theh last light of her life. Her last hour is getting an insulin shot from one the nurse. only to be seen next when it was to late. A nurse saw grab stomach and vomit. her her stomach and vomit came out of. She must have been so much pain. My claim’s of nurse possibly doing doing something as dumb as giving an insulin shot just look on the link above. Think of how mind blowing it must have been for Lisa in such condition be told to leave the hospital. this site below is what would happen if got a to insulin. It gets even worse for a non-diabetic. But in your mind of how easy it would be for one to make such a mistake. Bellow is another link of interest.